City Mayor Hamilton Green yesterday announced that he has taken legal action against the State owned media publication, Guyana Chronicle, suing the company for in excess of $100 million dollars, for what he says is a libelous article written in reference to him. “I’m a very fair man, those who know me will tell you …but due to a very nasty piece of writing; an article which was published in the Chronicle newspapers about me, I was advised by my Attorney Mr. Rex Mc Kay to take legal action,” Green told the media yesterday. 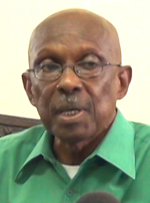 In an editorial which was published by the Guyana Chronicle on May 18, 2014 Mayor Green was accused of amongst other things, persecuting females in leadership positions within the Council. “City Mayor Hamilton Green’s proclivity for making war on females who assume leadership positions in the city’s hierarchal construct is well recorded, and three female Town Clerks prior to the appointment of Ms. Carol Sooba, as well as his new ally, Patricia Chase-Green, have been relentlessly persecuted and pilloried by Green…Thieves do not like fellow thieves who trespass on their turf. During the period 2004/2005, Green had relentlessly campaigned to have city Public Relations Officer Royston King relieved of his position on the basis of incompetence and mismanagement, and prosecuted for fraud and corruption,” the article stated. However, during a press conference yesterday, Deputy Mayor Patricia Chase Greene debunked the accusations leveled against Mayor Green. “I stand for principle… It is the Mayor who has been pushing women in the Council. It is the Mayor who agreed that women should be pushing themselves for higher positions in the Council and the Mayor is the one who tolerated the person who currently occupies the post of Town Clerk, for her to be given time off for eight years to pursue her studies.” Chase Greene added.